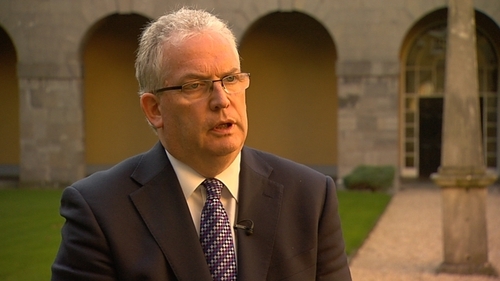 Director General of the HSE Tony O'Brien has said there is now a political consensus on how to develop the health service in the Sláintecare Report. He said the 10-year-plan is something that can survive the political-election cycle. Mr O'Brien called on people to get behind the plan as it was the best opportunity to develop the service. He said there will be hard choices to be made with the plan, as was also the case with the cancer strategy. He was speaking at the Policy Forum for Ireland seminar on 'The reform of healthcare in Ireland'. Mr O’Brien said the HSE National Service Plan for 2018 is expected to be published by mid-December. He said the HSE got a two-week extension to complete the plan, which is based on its 2018 Budget. He said it will be submitted to the Minister for Health by the end of next week. Speaking with regard disciplinary issues within the HSE, Mr O’ Brien said that his own role in the disciplinary process means he can not comment on any individual case of a consultant not fulfilling public duties in the health service. He said the general principle is that everyone in the health service needs to fulfill the terms of their contract. Mr O’ Brien said that if they failed to do so, they could be found in breach of contract and subject to disciplinary action. Meanwhile, Chief Executive of the National Association of GPs, Chris Goodey, told the conference that the failure to fix the health system was a national disgrace. He said in the RTÉ Investigates programme this week, it was heartbreaking to watch so many patients waiting for care and living in fear. The programme found a failure by the HSE and hospital managements to properly implement the 2008 Hospital Consultants' Contract across acute public hospitals. Mr Goodey said everyone was to blame for allowing the situation to be as it is. Liam Doran, general secretary of the Irish Nurses & Midwives Organisation, said two revolutions were needed in the health system. He said there needed to be a public work only contract for consultants and also for GPs. Mr Doran said the seismic changes needed could take 10-15 years.